LCR Embedded Systems’ engineering design team offers our customers decades of experience. We can either start with a high-level list of requirements detailing the challenge that a customer is facing, or we can start with a detailed set of precise specifications — or anything in between. 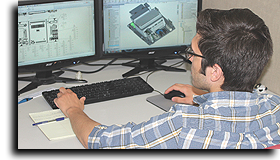 Our mechanical and electrical engineering team will take what you provide and develop a complete engineering design plan, keeping you informed during the entire process. LCR Embedded Systems also employs Concurrent Engineering and engages in full environmental testing to ensure that all issues are addressed in real time and dealt with as quickly as possible — before they become problems. Using these tools, LCR Embedded’s engineering design team will create your design as a 3-D model and perform structural and thermal simulations to gauge its performance. Electrical engineers will create the PCB schematics and artwork using MentorGraphics PADS. A variety of special reports are generated during this process, ensuring compliance with your stated specifications.